We are your company. Really, we are. The Association was founded by its member municipalities in 1989 when local rural communities had a desire to provide blue box recycling services to its residents but private industry was unwilling to provide that service. Since municipal corporations were not possible then, they created a non-profit corporation governed by elected representative from each member municipality in essence forming a municipal cooperative that remains unmatched to this day. The unique structure of the Association enables it to operate at arms length from its municipal owners providing a management environment similar to a private company focused on efficiency. Under the watchful eyes of the Board of Directors, made up of independent elected politicians, service remains an equally important component of our decision making process. We like to think that we operate in a gray area that benefits from the best of both worlds, private and public. Since we are owned by the municipalities that we service and you own them, that makes you not only our customer, but one of our owners too. We are much more than the company collecting and processing your recyclables. We don’t operate under the pressure of meeting shareholder’s return on investment targets. While the bottom line is not our priority, we respect the need to be fiscally responsible while providing the best service achieving the highest level of diversion. Since we don’t own or operate any disposal facilities, our focus remains on waste diversion initiatives and education is an important component of our offering. More information is provided on this page about our commitment to education. We act as the waste diversion department for each of our member municipalities enabling them to focus on other important issues in your community. 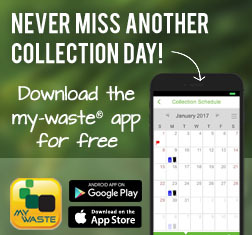 We provide the tools to maximize waste diversion, whether it is the free replacement recycling bins, award winning newsletters, this informative website with locally relevant information, our toll free number with knowledgeable staff - not a call centre, composters, digesters, Christmas tree chipping, and so much more. We lobby on behalf of the municipalities, report to authorities waste initiatives, report to members their progress to meet their environmental commitments, and provide the most innovative, effective, and efficient programs available. We believe that a logo should create an image that truly reflects the organization and all its activities. Our logo depicts the Association’s acronym at the roots of a white oak tree strategically placed above our already known Bluewater wave. The white oak, native to the area, standing tall above the waters of Lake Huron is notorious for its long life and stability, which the Association mirrors. The root system of the oak is as dispersed as its branches above, reflecting the Association's ownership in relation to its customer base. 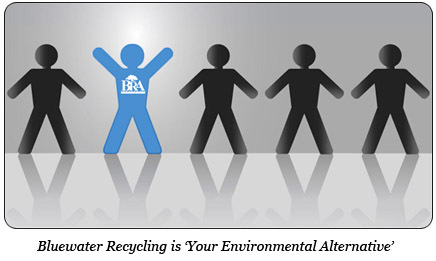 Likewise, the roots of the oak tree are connected into BRA, the acronym for the Bluewater Recycling Association, signifying that the Association is at the root of providing solutions to environmental issues. The letters are intertwined, representing the cooperative nature of our organization that connects so many municipalities. The bold, stylish letters symbolize the strength, creativity, and pro activeness of the organization. The wave is representative of the blue water of Lake Huron which most of our members have an opportunity to view regularly. Each colour used in the new logo also carries special significance for the Association. Green is synonymous with the environment in general. Blue is representative of the blue water of Lake Huron and is a colour that is widely associated with recycling. White is representative of the cleanliness and purity of the environment which we strive to achieve.